My daughter made this at girl scouts this year and we decided this was not only a great decoration for family and friends but a great gift to share. This ornament is special because not only is this simple enough for school age kids to make, it is one that everyone loves to receive! Who doesn't love chocolate! Assemble by placing Kit Tat on the bottom, arrange the mini bars starting with 4 then 3, 2, 1. Place candy bar stack onto the candy canes. 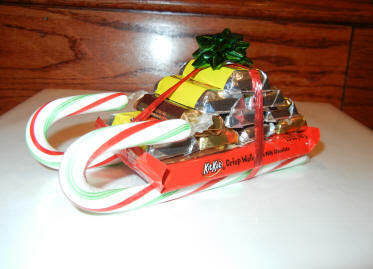 Use hot glue gun to hold candy bars and candy canes in place. Use the ribbon to tie together. Add a bow on top.